UNMATCHED HANDLING. ULTIMATE VERSATILITY. ADDED FLOTATION. The Timbersled ARO™ 129 LE gives you all of the benefits of the Timbersled ARO™ 120 with 12% more flotation. BEST HANDLING FOR UNMATCHED RIDER CONFIDENCE AND CONTROL: The state-of-the-art Timbersled ARO™ platform combines the Timbersled Traverse Ski™ and Timbersled Traverse Track™ with an aluminum chassis for precise handling in all conditions plus improved deep snow lift. TIMBERSLED ARO™ PLATFORM: The narrow and agile chassis enhances handling and minimizes rider fatigue so that you can go further, longer. The Timbersled ARO™ also features a raised drive shaft to improve lift to get the bike on top of the snow faster. TIMBERSLED ARO™ REAR SUSPENSION: The rear suspension combined with the raised drive shaft allows the Timbersled ARO™ to mimic the feel and performance of your dirt bike. The suspension delivers 30% more front track shock travel and 2" more overall suspension travel. The track approach angle is optimized for improved lift in deep snow. Premium FOX® ZERO QS3 shocks come standard. TIMBERSLED TRAVERSE SKI™ & TRAVERSE TRACK™: Skags and tri-keel shape provide a better grip and precise handling. Ski allows for better lean angles on hard-pack and more control in deep snow. 129" track features optimized snow window placement and an adjusted gear ratio to increase track speed and more power on the snow. With better climbing and increased traction, this track design is easier to lean and steer. TIMBERSLED® TRIO™: The ultimate in performance, handling and control. This supplemental front shock is available as an accessory, is easy to bolt on for snow bike use, and quick to remove when you convert back to dirt bike mode. TIMBERSLED® SUSPENSION STRUT (TSS) INSTALL KIT: Easily adjustable for all riding styles, the TSS Install Kit provides up to 70% more rear suspension travel and restores your dirt bike's natural suspension feel and pivot point. EASIEST TO CONVERT WITH THE INDUSTRY'S FASTEST INSTALLATION: Spend more time riding and less time going from dirt to snow. The direct bolt-on system and design mean that no bike or air box modifications are required. The bolt-on spindle is fast and easy with no drilling needed. Pre-bled brakes provide confident brake performance. DIRECT BOLT-ON SYSTEM: No bike or air box modifications are needed thanks to the Timbersled ARO™ direct bolt-on system and design. PRE-BLED BRAKES: The pre-bled brake system combined with no modifications needed for install translate to quicker, easier conversions from dirt to snow and back again. TIMBERSLED ARO™ SPINDLE: Save time with no drilling required. The Timbersled ARO™ spindle is a universal design for all bike brands. 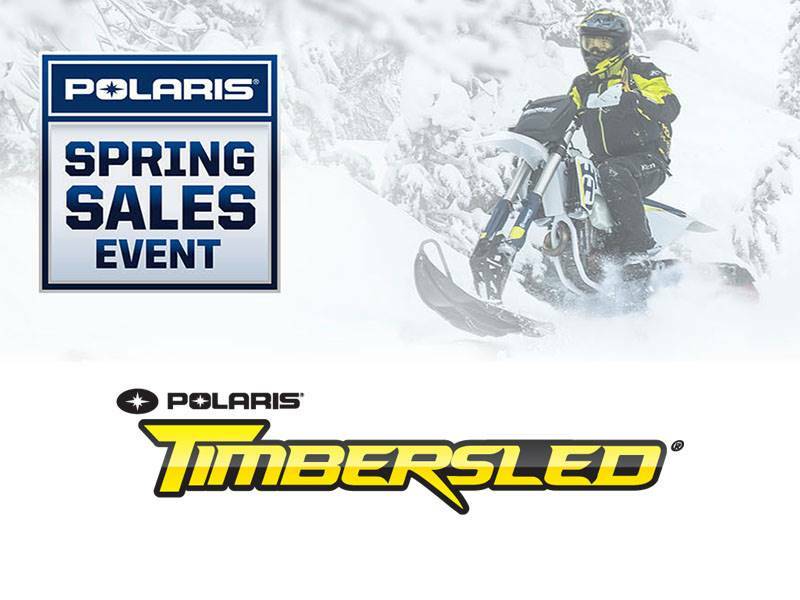 TIMBERSLED® TOUGH PROVEN PERFORMANCE IN THE TOUGHEST TERRAIN: Strong where it needs to be and light where it can be, the Timbersled ARO™ is the top choice of athletes and extreme backcountry riders. The aluminum chassis provides lightweight strength for increased durability without sacrificing performance. ENGINEERED TOUGHNESS: The Timbersled ARO™ is the top choice of racers as they dominate the race tracks thanks to its ultimate toughness. ALUMINUM FRAME AND EXTRUDED FRAME RAILS: Aluminum frame is both strong and lightweight. Extruded frame rails provide increased durability. SHIELDED BRAKE SYSTEM: Complete, pre-bled brake system with shielded design for consistent braking performance across all bike brands and weather conditions. Traverse - 129 x 11.5 x 2.5 in.